There are some foods that claim to be ideal for Yorkies and they have a different amount of calories present in them. Some foods are rich in calories while others have a low number of calories. There is no fixed rule that ½ cup is the requirement of a growing 6 months old pup. An Average puppy requires needs 45 to 55 calories per pound of body weight. Adults have different requirements they require less per pound. If you are using manufactured food for your Yorkie make sure you read the label which gives us the exact amount of servings depending on the weight of the dog. 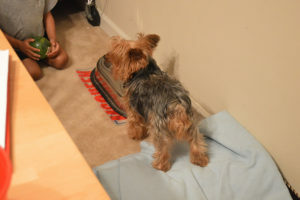 In a case of home cooking, a Yorkie will consume from ¼ to ½ cup per meat. You can also add Canine milk replacer which is better than goat and cows milk to change the routine of your Yorkie and soon your Yorkie will be on a fully solid diet. When your Yorkie reaches the age of 8 weeks and on, you can now feed it fully solid and healthy diet making sure that it is also balanced as well. You have two different choices of whether to cook your food at home or buy manufactured food from the market. However, home cooked food is more preferable there are some things that you need to remember before you buy manufactured food for your dog. Home cooked foods are more preferable as you can feed them with meat, vegetables, carbs, fruits etc.